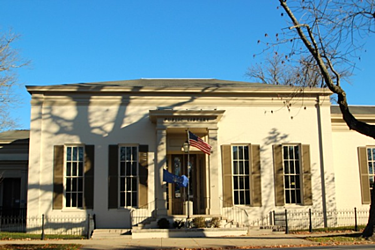 The Jefferson County Public Library’s main branch provides books, movies and classes to Madison, Indiana residents. While the knowledge in the library’s books is timeless, the building’s roof was not. 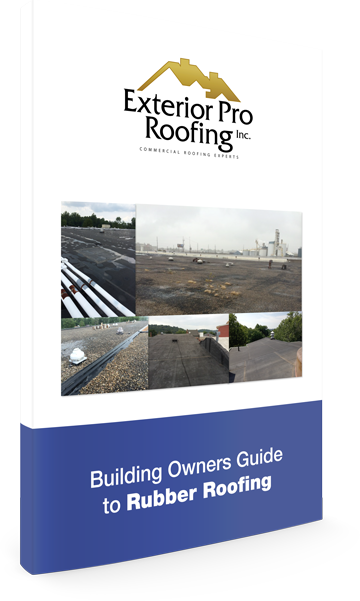 At the end of its product lifecycle, damaged roofing threatened the building’s daily operations. The library director called the one roofing company he knew he could trust from a previous job: Exterior Pro Roofing. The library has three sections. Each was covered in Firestone 60 mil EPDM rubber and tied-in to asphalt shingles. Transition areas merging one roofing system to another—in this case, EPDM to asphalt shingles—are common leak spots. Likely leak culprits included the custom sheet metal trim tie-ins where the rubber roof met shingles. Metal trim is commonly installed to keep tie-ins dry. However, most roofing contractors install these incorrectly, causing water damage. Exterior Pro needed to identify exactly where the problem areas were, and how bad the damage was, to make a solid recommendation for repairs. First, Exterior Pro Roofing made core cuts on all three roof sections. These are used to determine the roof’s membrane, insulation and level of water damage. The procedure confirms whether a complete tear-off is necessary. Two roof sections didn’t have water damage, but their rubber membrane was at the end of its life. The insulation underneath, however, was still usable. Therefore, Exterior Pro Roofing recommended laying new membrane over these two roof sections instead of a full tear-off. 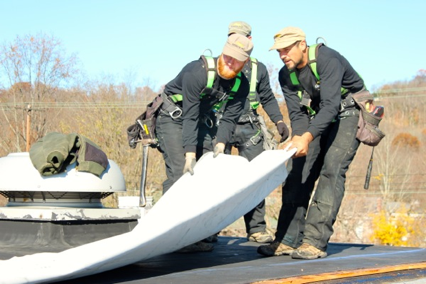 Roof tear-offs cost more than membrane overlays, so using core cuts on this job saved significant budget for the customer. Cycling is when the water in the substrate evaporates, condensates on the underside of a new membrane, and evaporates again. This process repeats itself, degrading the new membrane quickly. A lay over would only require replacement again far too soon, incurring unnecessary long-term costs for the customer. Exterior Pro Roofing recommended removing this section entirely and installing new membrane. Libraries are the backbone of communities. As local businesspeople who live and work in the area, the Exterior Pro team felt it was important to keep this one open during repairs. To do that, a lull—a heavy-duty forklift—was deployed to the job site. The lull enabled the team to quickly, easily and safely hoist materials and tools to the roof. It also sped up the removal of trash and debris from the job site. A 40 mil. gray Duro-Last® PVC membrane was installed first. Then, the custom sheet metal trims over the tie-ins were replaced. Because so many roofing contractors get these wrong and cause water damage, Exterior Pro made sure to install the driest tie-ins possible. The team also ensured the tie-ins gave the building’s exterior a clean look. Thanks to the initial roof assessment and smart use of equipment, the job was quiet, smooth and fast. It was also cost-effective: the membrane overlay saved the customer significant costs. The library stayed open during the entire job. Debris was removed daily to keep the work environment clean as patrons entered and exited the building. 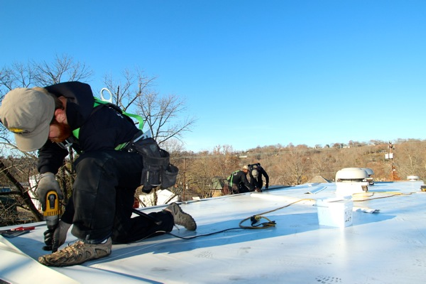 With the job complete, the new roof received a 15-year, no-dollar-limit warranty, and was successfully third-party inspected. The result: a happy customer. Exterior Pro prides itself on building lasting relationships with owners, directors and property managers. This time was no different. The library director hired Exterior Pro based on previous work on the Jefferson County Public Library system’s Hanover branch. He knew that Exterior Pro did quality, cost-effective work that was quick, clean and non-disruptive.